Here is one of my game at the recently concluded - Penang International Chess Tournament. Thanks to my rooks and d4 pawn, i had a total control over the position. However, white's knight on c4 is threatening my rook on e3 and if i move the rook then the d4 pawn will lost, so i had to make a crucial decision here.... 25...Rxf3! 26. Qxd4 Of course 26. gxf3?? will lost the lady after 26...Nh3+ . Now i have lost my strong d4 pawn so i must find something big to compensate the loss. I got around 20 minutes left at this point. I sense that there is a tactical combination here . I calculated a variation starting with 26...Nh3+ but unfortunately some where along the line, i did not find a mate, so i choose a wise desicion of maintaining the initiative. 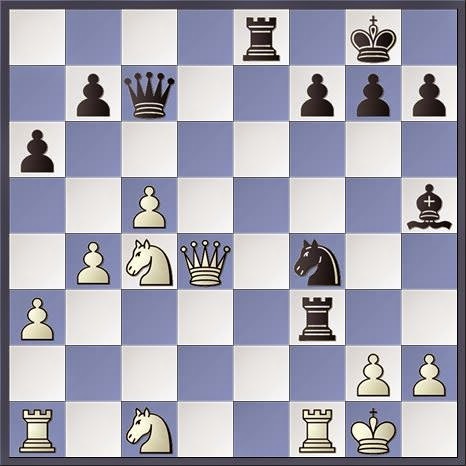 26... Rxf1+ After the game, Mr. Fritz shows that the spectacular...26... Nh3+ !! will work nicely after 27. gxh3 Rg3+! 28. hxg3 (28. Kf2 this is actually the reason why i reject 26...Nh3+ but again Mr.Fritz shows that after 28...Rg6! black have to give back material to avoid being mate for e.g. 29. Nd6 Qc6! threatening 30.Qg2+ or 30.Qf3+) 28... Qxg3+ 29. Kh1 Bf3+ 30. Rxf3 Re1+ 31. Rf1 Rxf1+ 32. Qg1 Rxg1# checkmate. 30... Bg6 maintaining the pressure.